(Newser) – The Detroit Tigers took the lead on Delmon Young's ringing double in the 12th inning. Then came the blow that really staggered the New York Yankees. A little grounder up the middle left Derek Jeter sprawled in the dirt, screaming in pain. The Yankees had lost more than the AL championship series opener—they had lost their captain for the rest of the postseason with a broken left ankle. 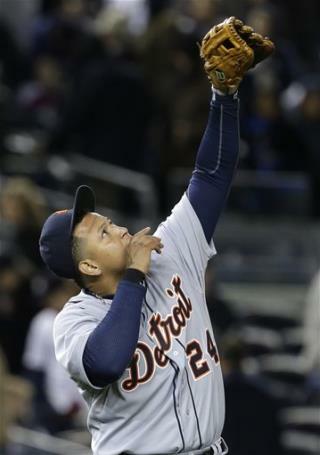 Detroit's 6-4 win and Jeter's injury last night capped a game of wild swings and wild swings of emotion. Just watched Yankees drop game two. The talent and payroll on this team and they look pathetic... Feel bad for Jeter but I don't blame him. This Playoffs started off so good. Would have liked to have seen Nats, Cincinnati, and Oakland advance. -hate cardinals. Leyland's damn lucky the Tigers won. What a pitiful managing job. As a Tiger fan, I guess I should feel happy about Jeter's injury, but I am not. It's kind of a bummer to see anyone go down on such a routine play. If it's any consolation to the Yankees fans, last night had its casualties on the Detroit side as well. They'll probably pull Tiger closer Valverde who blew last night's 4-0 lead in spectacular fashion, forcing the extra innings where the Jeter injury occurred.